Crazy or not, you have to give the photographer credit for being able to capture such an amazing image. Trying to capture a normal shot of a wave like this is no easy task, so I imagine that doing it in hot water while surrounded by lava would not make it an easier. This is amazing and a hell of a job! Whoa! And ALOHA! 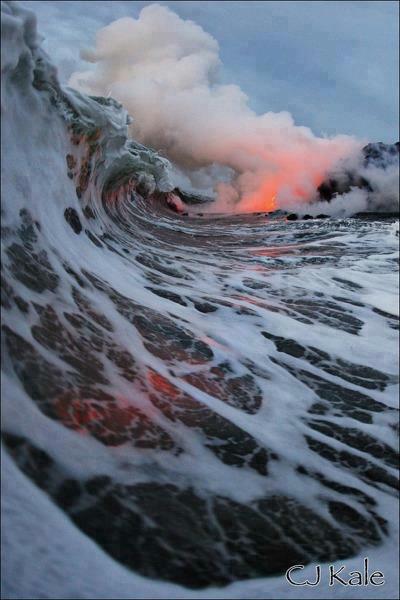 As one with Family & friends living on the Big Island (Hilo Side) and having seen literally 1000’s of shots of Kilauea lava pouring into the sea… This is one extraordinary shot! For those unfamiliar with Kilauea, it’s a (obviously quite active) volcano on the Big Island of Hawai since 1984i. And to get an idea of the danger involved in getting a shot like this, a few years ago I was visiting when two tragedies happened involving tourist photographers; both ignoring posted warning signs. One was a guy who walked past the barricades and walked out on a lava field; unaware that he was walking on the this crust above a Lava Tube (a fast-moving stream of molten lava). As his horrified friends watched, the surface broke and he fell into the molten lava and vanished! The other involved a group of people who wanted to get close to where the lava was pouring into the sea… and a wave of Boiling seawater splashed over them causing major 3rd degree (the worst) burns! So Mahalo CJ Kale! Congrats on an extraordinary (albeit risky!) photo! Aloha! From the the bottom of my heart, thank you C.J. Kale for providing such a shot to the whole world.